Sundays are always a cooking day here. I usually have time to watch the solar cooker often enough so that I can make more than one thing. It’s fun to try my hand at a few dishes in a day. After making jam yesterday morning, I thought I’d try a modified China Study Cookbook recipe that my family had enjoyed before. It’s fast and only takes one dish and the kids eat it. I added in lentils though, because I like a little more protein with out dinner. Combine all the above ingredients and cook in the solar cooker, covered, till the rice and lentils are soft. Mine came out well, but I didn’t time the solar cooking perfectly. I started too late in the afternoon and had to finish it off in the microwave. I keep forgetting how important cooking early is! Rating: hearty. It would be a good winter meal and it leaves us with ample leftovers for lunch. 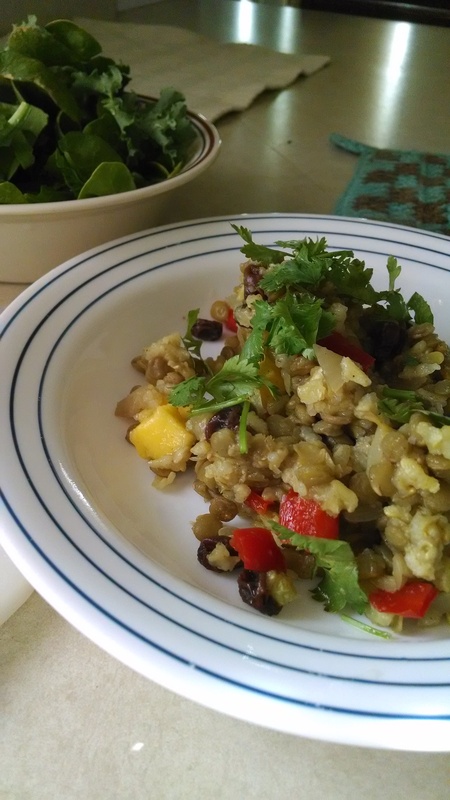 If you like it sweeter, leave out the lentils and substitute orange juice for 1/2 cup of the water.